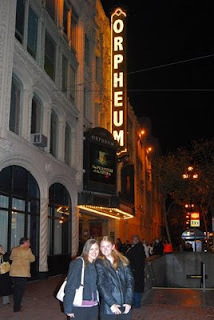 Tonight Isaac and I went to see The Phantom of the Opera in San Francisco with my parents and siblings. We left from a family dinner at my grandma's house around 6:30 to get to the Orpheum Theater to pick up our tickets at will call. It was great timing, actually, because we got our tickets, took a few pictures outside, and then got to go sit in the lobby, out of the cold, until the house opened and we could find our seats. I didn't much care for Raul, but I basically liked the other people. This Carlotta is the longest running Carlotta worldwide, supposedly. She has done over 4,500 performances. The weird thing for me was the chandelier. It was always close to the stage, and when it "fell," it sort of coasted onto the stage slowly with a flash but no crash. I swear when I saw it 13 years ago, it fell straight down over the audience and then swung onto the stage. Tonight the chandelier was pathetic, really. Oh well. The rest of it was cool. The stage was beautiful, the music is enchanting as ever, and this time I didn't even have Patrick sobbing in the seat next to me! Awesome Christmas fun! That is something I want to do some day!